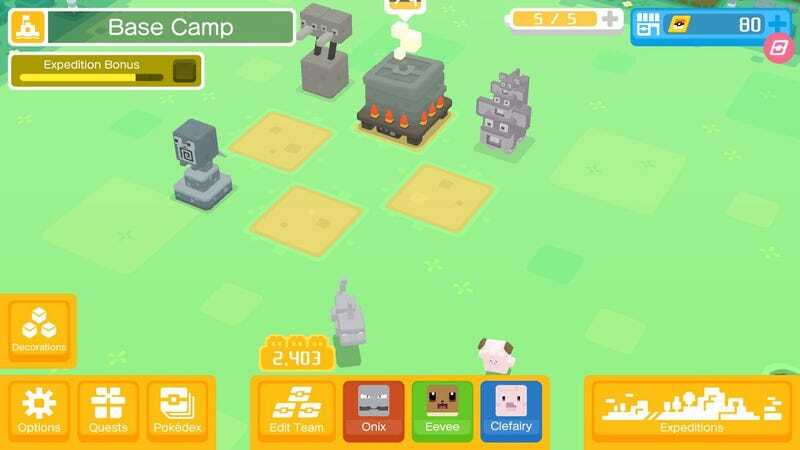 Pokémon Quest Is… Fine. It’s Fine. Pokémon Quest is a cute little RPG that I enjoy playing, but that I feel like I’ll enjoy more once it actually comes to phones in June. On the same day that Nintendo announced Let’s Go Pikachu and Eevee, they also announced that there’d be a small, “free to start” game available on the Switch’s eShop that day called Pokémon Quest. It’s wildly different from other Pokémon games, right down to the art style, which renders everything in cubes. There’s some stuff to like in here. In order to catch new Pokémon, you have to cook food using ingredients you pick up from battles. You discover recipes by playing around with ingredients which have descriptors like “Soft and sweet” or “Hard and small.” The recipes that result will then have descriptions like “lots of soft and small things, and a lot of blue,” and will all attract different Pokémon. This new approach to interacting with your monster friends is charming. Every time I look at my current team I just want to pet them all. And check out the Clefairy I just caught. Customizing stats is also a fun little management puzzle. You earn Power Stones from battles that up your Pokémon’s HP and attack power. You can earn other kinds of stones that modify your Pokémon’s moves slightly, like giving a blast attack more projectiles. I have enjoyed swapping out my stones among my Pokémon and then watching how it changes their attacks. One nice thing is that the free-to-start nonsense hasn’t actually bothered me that much. The premium currency, PM tickets, can be used to speed up your cooking time, recharge the battery that allows you to go on expeditions and buy decorations for your base. You can pay $30 for a pack of tickets and stones. My boss Stephen Totilo did, but I haven’t bothered. The game is so thin that every time it prompts me to wait for something to recharge, I’m happy to wait and do something else. If this was a phone game, I’d be pulling it out every time I was on the subway. On my Switch it seems like a waste of space next to other, more substantial games I could be playing. My little Pokémon team is still adorable, and I still like mixing random ingredients to cook new recipes. But there’s just not a whole hell of a lot going on in Pokémon Quest to keep me hooked while I have other things vying for my attention.